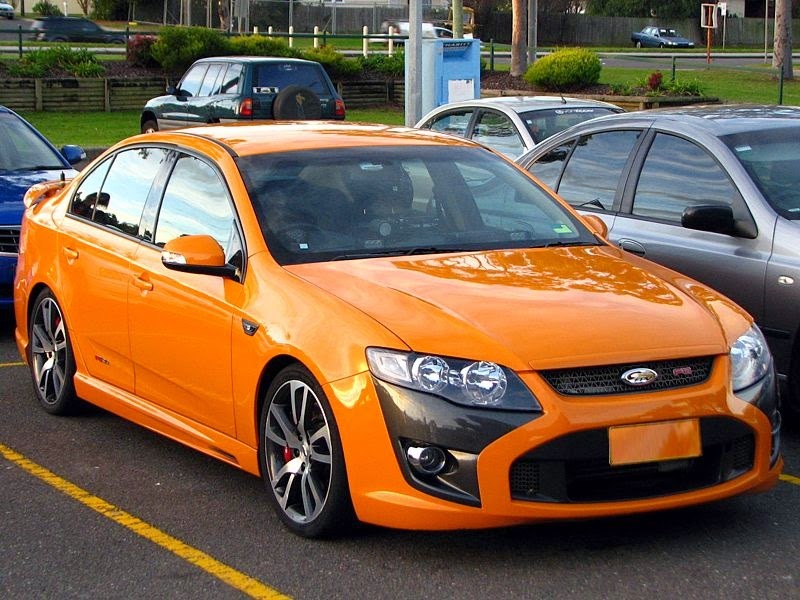 The FPV F6 is an automobile which has been produced in Australia by Ford Performance Vehicles since 2004. 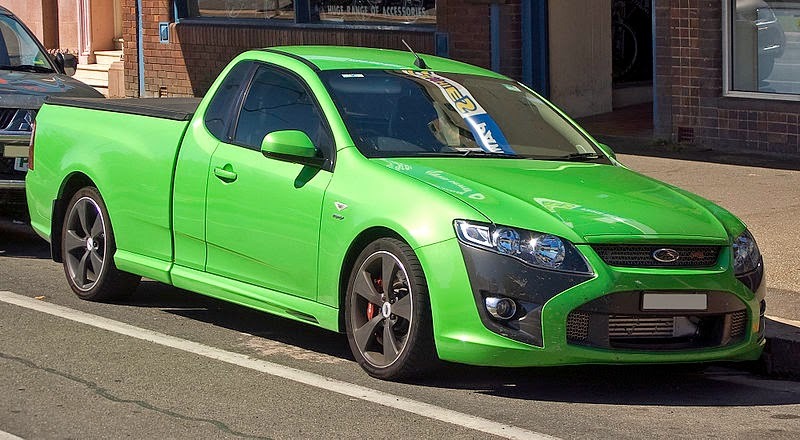 It is a high-performance derivative of the Australian Ford Falcon. Prior to the release of the FG series F6 in 2008, the sedan and utility models were marketed as the F6 Typhoon and F6 Tornado respectively. The F6 is based on the modern-classic Ford Falcon XR6 Turbo sports sedan. The F6 engine is based on the XR6T motor, a turbocharged 4.0L Inline Six, but includes: a modified FPV airbox (with Dual Ram Air intakes), higher strength conrods, larger air to air intercooler, high flow exhaust system, higher capacity fuel pump, and a Garrett GT3540 (same as the BA/BF XR6T) turbocharger with an internal gate (up from the GT3040 on the FG XR6T)running 0.64 bar of boost on the BA/BF models and 0.91 on the FG. This engine is known for its wide, flat torque curve, with peak torque of 565 Nm (417 lbft) available from 1950 to 5250 rpm(FG F6). This equates to strong acceleration throughout the rev range. The F6 represented a diversification of sorts for FPV, broadening the reach of the brand to turbo buyers, a typically younger demographic than the V8 buyers that the Australian manufacturers traditionally cater to. The New South Wales Police Force and Queensland Police Service sometimes use the FPV F6 as Highway Patrol vehicles. But the majority are the FG XR6 turbo model with the optional brembo brakes and F6 wheels fitted, or the VE-VF SS commodore. The F6 Typhoon first emerged in FPV's late-2004 BA MkII facelift. The car's 4.0L DOHC 24V Turbocharged Inline Six-Cylinder engine made 270 kW (360 bhp) at 5250 rpm and 550 Nm (410 lbft) at 2000-4250 rpm of torque. It was only offered with a Tremec T-56 6-speed manual gearbox. The car had a more low-key look than the V8-powered FPV's with a lower rear wing, no body stripes. The F6 had 18-inch (460 mm) alloy wheels, and PBR 325 mm (12.8 in)/2-piston brakes offered as standard with 355 mm (14.0 in)/4-piston Brembos offered as a $5K option. With the BF update of 2005 came no power or torque increases, but a host of different updates in other areas. A ZF 6-speed sequential automatic transmission became available. The other key update was a brake upgrade - a Brembo 355 mm/4-piston package becoming standard, with a 355 mm/6-piston package is optional. The F6 also scored a more aggressive bodykit to further differentiate it from other vehicles in the FPV range, as well as 19-inch (480 mm) "Dark Argent" Alloys. The F6 Tornado Ute entered production in May 2005. The F6 Typhoon did not get any mechanical upgrades with the BF MkII update of late-2006. Minor changes included new design alloy wheels and a change to graphite foglamp surrounds (instead of body-coloured). In 2007 300 limited edition "R Spec" versions of the BF MKII F6 Typhoon were made available. This model was equipped with several upgrades including stiffer suspension and 19'x8" alloy wheels which sought to improve the car's handling. Additional upgrades also included leather seats as standard, R Spec floor mats, Interior Car Console MP3 accessory port and F6 R Spec build plates and badging. Colours that the R Spec Typhoon was released in included Winter White, Lightning Strike, Vixen, Neo, Ego, Bionic and Silhouette. Apart from their badging, R Spec Typhoons can be identified by their Thurderstorm Grey inserts seen on the front and rear bumper bars, fog light surrounds, rear spoiler pillars and alloy wheels. The R spec model was also available as a special order in custom option colour choice, At Least Two are known to be in Fords "Conquer Blue Metallic" with the Dark Ardent inserts. (One being car number 141 of the 300, which is also one of ten imported to New Zealand and the only manual of those 10). FPV released a new FG Falcon-based range in 2008, including F6 models which no longer used the Typhoon and Tornado monikers. The 4.0L Turbo engine has been further enhanced, with power increased to 310 kW (420 bhp), and torque to 565 Nm (417 lbft). Key changes included new front suspension, a new steering rack, all-new exterior and interior design and a revised 6-speed manual transmission with launch control. The brake specifications, and the ZF 6-speed automatic remained unchanged. In 2008 it won New Zealand Autocar Magazine's Car of the Year Award. The F6E, an executive variant of the F6, was announced in July 2009 for sale from September. In 2005, the BAII F6 Typhoon was disqualified from Motor magazine's annual Performance Car of the Year competition due to a series of clutch failures. After initially blaming the magazine's testers, FPV labelled the car as "simply too powerful" and withdrew the car from sale for several months while they engineered a fix. All of the cars released with the clutch issues were recalled. The F6 Typhoon returned to win Motor magazine's Australian Performance Car Of The Year award in 2006.